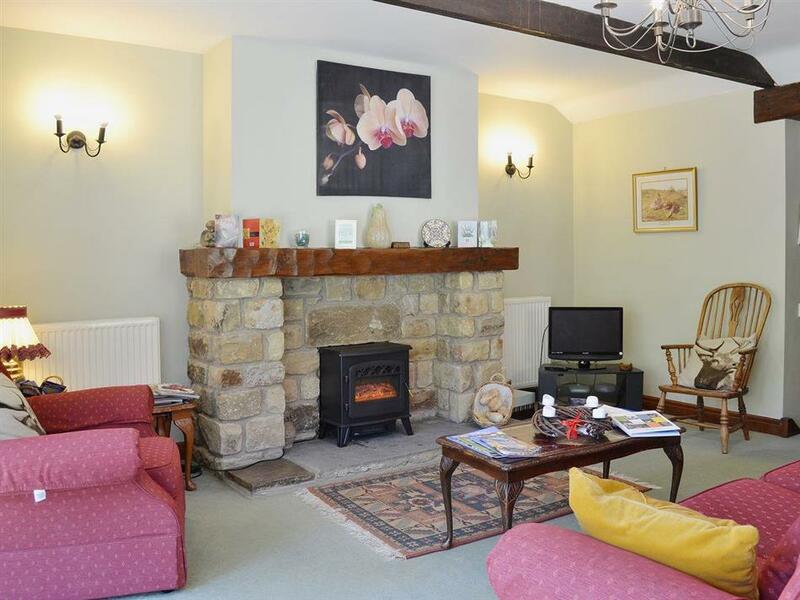 The Smithy, Laskill Grange in Bilsdale, near Helmsley sleeps 4 people. Within the North York Moors National Park, in a sheltered wooded valley close to the magnificent ruins of Rievaulx Abbey, these spacious, comfortable and well equipped holiday cottages stand in a landscaped courtyard, close to the owners’ farmhouse. 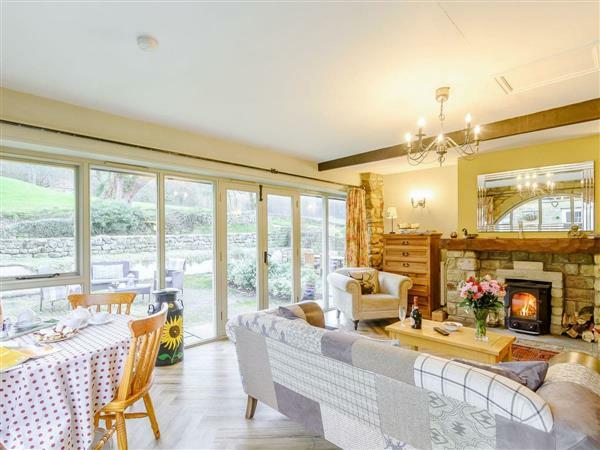 Guests can enjoy farmhouse breakfasts in the conservatory at Laskill Grange, while across the drive at Laskill Country House, the owners’ daughter offers home cooked evening meals or ready prepared frozen meals to enjoy in the comfort of your holiday cottage. Bridge Cottage and The Coach House have an interconnecting door and may be booked together to sleep 6. Visitors can wander the 70 acres of beautifully tended grounds or relax in the shared terrace garden with its small lake and river frontage. The views over the surrounding countryside are superb, and there is excellent walking from the doorstep. Long distance footpaths along this area’s Heritage Coastline, and the Cleveland Way, offer perfect terrain for walkers and cyclists. The Ryedale Folk Museum at popular Hutton-Le-Hole, and the ruins of Rosedale Abbey are both worth a visit. For a day out, the North York Moors Railway runs steam train journeys between Grosmont and Pickering. Whitby, is easily reached, with miles of sandy beaches and an ancient abbey overlooking its harbour. Scarborough, and the coastal villages of Staithes, Runswick Bay and Sandsend are all within 20 miles. Horse racing at Thirsk, Wetherby and York, 25 miles. Closer to home, Helmsley has Duncombe Park and a castle. Shop and pub 2 miles. All properties (refs 13920, 13919 [The Forge], 15624 [The Coach House], 16322 [The Granary]): Electric, bed linen and towels included. Cot. High-chair. DVD. CD. Electric cooker. Microwave. Dish washer. Shared payphone. Patio areas. Barbeque. Shared terrace garden. Shared 70-acre grounds. Ample parking. Shared hot tub. Natural water supply from spring. NB: There is a small lake and river frontage within the garden. Oil central heating (extra charge). Washing machine. Holidays at The Smithy, Laskill Grange run from Saturday to Saturday. For a better idea of where The Smithy is, you can see The Smithy on the map below. The Smithy is in North Yorkshire; should you be on the lookout for a special offer, you can find all the special offers in North Yorkshire. It's always worth checking to see what is on offer at the moment. Do you want to holiday near The Smithy (13920), you can see other cottages within 25 miles of The Smithy; have a look to find your perfect holiday location.